Rabbit anti acetylated Histone H4 antibody (AHP418) used for the evaluation of acetylated histone H4 expression in rat intestine by western blotting. Acetylation on histone 4 in the trinitrobenzene sulfonic acid (TNBS) rat model of inflammation. A: Sham (saline treated) operated and TNBS treated rat large intestine. Rats were Sham or TNBS treated for 7 days before sacrifice. 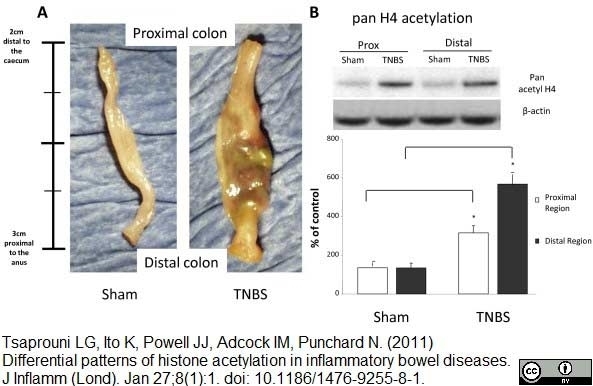 Well-advanced inflammation is apparent in the colon of the TNBS rat model. B: Pan acetylation on histone 4 (H4). The Sham model was saline-treated and therefore less inflamed (control). Results were obtained by Western blotting. The ratio of the density of histone H4 bands over β-actin control bands was calculated. In order to evaluate changes in density from different Western blotting experiments control densitometry was denoted as 100% and differences were accounted as increase percentage of the control. Representative examples of bands obtained are also illustrated. Columns represent the densitometric evaluation of three independent experiments (mean ± SEM). (*p <0.05 vs Sham proximal or Sham distal respectively). From: Tsaprouni LG, Ito K, Powell JJ, Adcock IM, Punchard N.
Differential patternsof histone acetylation in inflammatory bowel diseases. J Inflamm (Lond). 2011 Jan 27;8(1):1. Acetylation on histones 3 (H3) and 4 (H4) in Lewis and Sprague-Dawley dextran sulfate sodium (5% DSS) treated rats. Tissue samples were obtained from the sigmoid colon of the animals. A: Representative bands of H4 and H3 acetylation as obtained by Western blotting. β-actin levels were measured to ensure equal protein loading. The results are representative of three independent experiments. B, C: Graphical analysis of data Lanes represent: (1) non-DSS treated Lewis rats (control), (2) DSS-treated Lewis rats, (3) non-DSS treated Sprague-Dawley rats (control) (4) DSS-treated Sprague-Dawley rats. Columns represent the mean ± SEM of three independent experiments (*p <0.05). D: Histone 3 (H3) and histone 4 (H4) localisation in Peyer's patches of dextran sulfate sodium (DSS) treated Lewis rats. H3 is acetylated mainly in the mantle zone and H4 is acetylated throughout the surface of Peyer's patches to both mantle zone and germinal centre cells. In Peyer's patches of untreated animals no acetylation on either histone 3 or 4 was apparent. Micrographs are representative of two individual experiments for each strain. Isotype controls show no staining. Rabbit anti acetylated Histone H4 antibody (AHP418) used for the evaluation of acetylated histone H4 expression in human Chron's disease intestinal tissue by western blotting. Acetylation on histone 4 (H4) and H4 lysine residues in Crohn's disease. Columns represent the mean ± SEM of three independent experiments. Four biopsies were pooled to obtain sufficient protein for one experiment (50 μg of protein) (*p <0.05 vs control). Pan acetylation on H4 in Crohn's disease (A). 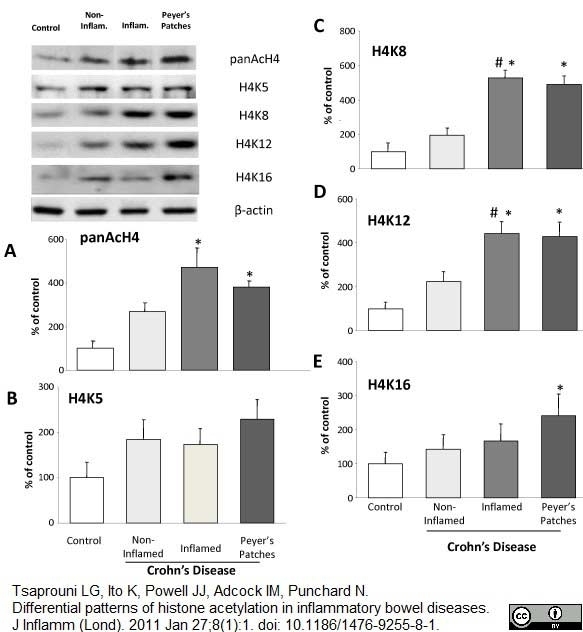 Acetylation on histone 4 (H4) specific lysine residues 5 (K5) (B), K8 (C), K12 (D), and 16 (E), in non-inflamed, inflamed tissue and Peyer's patches of Crohn's disease patients. Results were obtained by Western blotting. Columns represent the mean ± SEM of three independent experiments. (*p <0.05 vs control, #p <0.005 vs non-inflamed CD). Representative images of the bands obtained are illustrated. Rabbit anti Histone H4 (Acetylated) antibody was raised against the tetra-acetylated form of histone H4 and recognizes acetylated isoforms of histone H4. Antisera to acetylated histone H4 were raised by repeated immunisation of rabbits with highly purified antigen. KLH-conjugated peptide acetylated at lysines 5,8,12,16: NSGRGAcKGGAcKGLGAcKGGAAcKRHYCC. Turner, B.M. et al. (1989) Histone H4 acetylation in human cells. Frequency of acetylation at different sites defined by immunolabeling with site-specific antibodies. FEBS Lett. 253 (1-2): 141-5. Turner, B.M. et al. (1992) Histone H4 isoforms acetylated at specific lysine residues define individual chromosomes and chromatin domains in Drosophila polytene nuclei. Belyaev, N. et al. (1996) Differential underacetylation of histones H2A, H3 and H4 on the inactive X chromosome in human female cells. Hum Genet. 97 (5): 573-8. Perry, P. et al. (2004) A dynamic switch in the replication timing of key regulator genes in embryonic stem cells upon neural induction. Cell Cycle. 3 (12): 1645-50. Nye, A.C. et al. (2002) Alteration of large-scale chromatin structure by estrogen receptor. Mol Cell Biol. 22: 3437-49. Tsaprouni, L.G. et al. 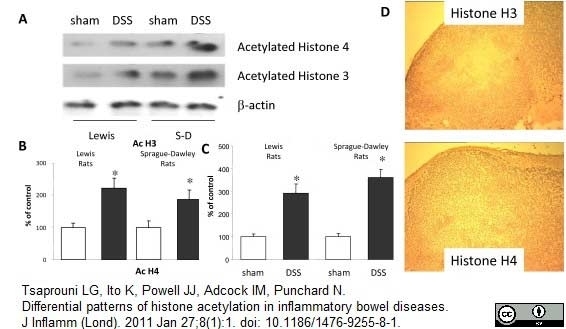 (2011) Differential patterns of histone acetylation in inflammatory bowel diseases. J Inflamm (Lond). 8: 1. Tian, L. and Chen, Z.J. (2001) Blocking histone deacetylation in Arabidopsis induces pleiotropic effects on plant gene regulation and development. Proc Natl Acad Sci U S A. 98: 200-5. Beck, H.C. et al. (2006) Quantitative proteomic analysis of post-translational modifications of human histones. Mol Cell Proteomics. 5: 1314-25. Catley, M.C. et al. (2004) Inhibitors of protein kinase C (PKC) prevent activated transcription: role of events downstream of NF-kappaB DNA binding. J Biol Chem. 279: 18457-66. Collas, P. et al. (1999) Active transgenes in zebrafish are enriched in acetylated histone H4 and dynamically associate with RNA Pol II and splicing complexes. J Cell Sci. 112: 1045-54. Foy, R.L. et al. (2008) Role of Jade-1 in the histone acetyltransferase (HAT) HBO1 complex. J Biol Chem. 283: 28817-26. Lin, X. et al. (2001) Reversal of GSTP1 CpG island hypermethylation and reactivation of pi-class glutathione S-transferase (GSTP1) expression in human prostate cancer cells by treatment with procainamide. Santos, A.P. et al. (2002) The architecture of interphase chromosomes and gene positioning are altered by changes in DNA methylation and histone acetylation. J Cell Sci. 115: 4597-605. Barzotti, R. et al. (2006) DNA methylation, histone H3 methylation, and histone H4 acetylation in the genome of a crustacean. Vega-Flores, G. et al. (2014) The GABAergic septohippocampal pathway is directly involved in internal processes related to operant reward learning. Cereb Cortex. 24 (8): 2093-107. Dincman, T.A. et al. (2016) Histone deacetylase inhibition is cytotoxic to oligodendrocyte precursor cells in vitro and in vivo. Int J Dev Neurosci. 54: 53-61.